Review: "Ray, Rick: Out of the Mist of Obscurity" - Sea of Tranquility - The Web Destination for Progressive Music! Progressive/hard rock's most prolific group of the last decade, The Rick Ray Band, is back once again with another energetic collection of guitar heavy songs. 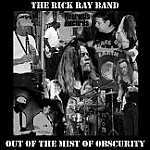 With a seemingly endless penchant for coming up with hard -driving guitar rock, axe-slinger Rick Ray has put together one of his finest releases here in Out of the Mist of Obscurity. Letting Phil Noche get into a groove and handle the bulk of the lead vocals seems to be the right thing to do at this point, as the singer sounds more confident this go around, and the songs seem all the more better for it, allowing Ray to unleash his amazing guitar talents, as well as the melodic reed work of Rick Schultz. Songs like "Trying Too Hard" and "Why Did I Know" are great hard rock pieces featuring killer riffs and solo moments from Ray and Schultz, and Noche's gruff vocals add a real rootsy charm. The acoustic rave-up "Reflections" has a real bluegrass-meets-The Beatles feel, and the CD's two instrumentals, "Death of the Swineherd" and "A Willing" are both gems of psychedelic hard rock featuring Ray's Frank Marino inspired fret work. The moody "Demons" features a pensive vocal from Ray as well as a virtuoso wah-wah drenched guitar solo that would make Robin Trower proud. There's solid heavy blues on "Waiting" and complex hard rock on "Under a Spell", both tunes probably will make show stoppers in a live setting, especially the latter which sees Schultz soloing madly above the intricate riffs of Ray. The epic title track is one of the most adventurous pieces that this band has done, as it mixes lush acoustic passages with moments of intricate and heavy riffs. Ray has perhaps his best vocal performance on the CD here, and his multi-layered guitar work gives a very full sound and seems to take over the role of a keyboard player at times. The neat effects and solos towards the end of the song are quite impressive. There are 11 songs in total on Out of the Mist of Obscurity, which offer a nice balance of different styles. In the past the band has included sometimes too many tracks which can intimidate the listener, but here the length works just fine. A very solid album from a workhorse band. I hear a 1972 Capt. Beyond influence in there....I mean that in a good way.